These handmade flower vases are designed to hold books between them, or desktop tools inside them. Who says flowers and water don't belong in a library? Monika Lubkowska-Jonas' mouth-blown glass vases let you add a dash of natural beauty to your bookshelf. 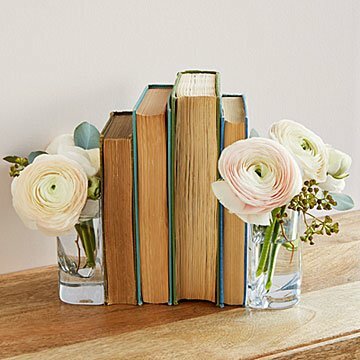 With substantial bases, they make sturdy and distinctive bookends that hold your favorite flowers, but also invite you to store stationery, pencils, and paintbrushes paired with go-to books on your desktop. They make a great gift for modern design aficionados and floral enthusiasts alike. Handmade by glass artisans in Poland. Self-taught designer Monika Lubkowska-Jonas thrives in a busy commercial environment but manages to keep in touch with her natural visual talent. While she believes that a thorough knowledge of production processes is the foundation of good design, her ultimate goal is simplicity, beauty, and timelessness in everything she creates. Understanding the techniques and potential of handmade glass and porcelain allows her to design effectively and imaginatively. Beautiful concept. It could be stronger. I like it. I'm still using it.However, I wish it was heavy enough to hold more books. I can only put a few books in between, or they will fall over. I exchanged a birthday gift from my son and daughter-in-law for something that was more practical for me as well as beautiful and I enjoy looking at them every day on my desk. Gorgeous multi-use charming bringing outdoor indoors! I might buy this product again. This was a belated wedding gift for a very special couple in my life. Since I could not be present at their wedding, I wanted a gift that was unique and spoke to their personalities. They are college professors, bibliophiles, and love flowers. The perfect gift to combine their two loves! Good place to shop for items you won't find in every other store. Beautiful design and has lots of uses. I use this item to hold fresh flowers and a few small books. I use these in my kitchen for bookends to some of my cookbooks and when I have flowers in them they look just lovely! I am very happy with my purchase.